Click here for audio of Episode 820. Today, low-cost housing proves to be much more than we first thought. The University of Houston's College of Engineering presents this series about the machines that make our civilization run, and the people whose ingenuity created them. We've all seen those elementary houses in poor neighborhoods. They consist of three or four rooms in a row, with a forward-slanting roof over a front porch. John Michael Vlach finds that those old houses tell a very interesting story. We call them shotgun houses. In the 1930s we decided they must be a regional invention from the Louisiana bayou country. That's where the older ones seemed to be concentrated. But Vlach looks more closely at old records. He traces the shotgun house to the early 1800s. Then he finds older shotgun houses in the sugar-growing plantation islands -- in Haiti and the Dominican Republic. Finally, he finds that same distinctive design in West Africa. If those were the houses of the poor, they were houses of people forced to be poor. They're an adaptation of homes the slaves had left behind. They're an African technology carried into the new world. But they came by an indirect route. You see, the American slave trade was far too brutal. We systematically severed slaves from their cultural origins. The shotgun house had to find its way here through the Caribbean. In 1810 the population of New Orleans was just over 12,000. One third was white, one third was slave. The last third was a population of free blacks, most of whom had come here from Haiti. They brought the shotgun house design with them. And what they made of it was not ghetto housing by any means. The shotgun house builders in Haiti had written African motifs into their exterior timber framing. Now shotgun houses in New Orleans sprouted American gingerbread trimming. By the mid-19th century, many are positively Victorian in appearance. When the cost of wood fell during the late 1800s, the shotgun house did indeed become the best way the poor could keep a roof over their heads. 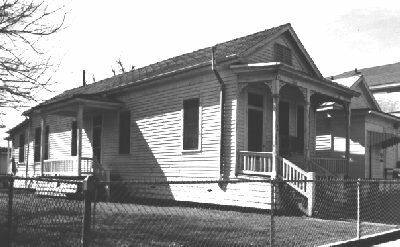 But, by then, shotgun houses had added a new element to the American architectural vocabulary. You see, shotgun houses gave us the southern porch. We didn't previously have porches like that in America. Like the shotgun house itself, southern porches are now all over America. So the next time you see those rows of small linear houses in poor neighborhoods, consider what you're really seeing. These are the remains of an African technology that reached considerable elegance among people of middle means in the 19th century. And it's a technology that left an indelible and formative mark on our landscape. It propagated that outward-looking sign of community over America -- the front porch from which we've greeted friends and neighbors ever since. Vlach, J.M., The Shotgun house: An African Architectural Legacy, Common Places: Readings in American Vernacular Architecture . (D. Upton and J.M. Vlach, eds.) Athens, GA: The University of Georgia Press, 1986, pp. 58-78. Vlach, J.M., Sources of the Shotgun House: African and Caribbean Antecedents for Afro-American Architecture . Vols. I and II, Doctoral Dissertation, Department of Folklore, Indiana University, March, 1975. Vlach, J.M., Afro-Americans, America's Architectural Roots: Ethnic Groups that Built America . The Preservation Press, pp. 43- 47. I am grateful to Ellen Beasley, architectural historian, and Margaret Culbertson, UH Art and Architecture Librarian, for suggesting the topic, and to M. Culbertson for providing the source material.